If you can no longer use the stairs in your home because of old age or a physical limitation, you can benefit from having a stair lift installed. A stair lift will give you the mobility back that you need to travel between the floors in your home. The great thing about stair lifts is that there is one that will fit any budget. The cost of stair lifts has decreased as their popularity has increased. More and more people are having stair lifts installed in their home so they can live independently. Having a nurse come to your home or moving to an assisted living facility is far more expensive than purchasing a stair lift. 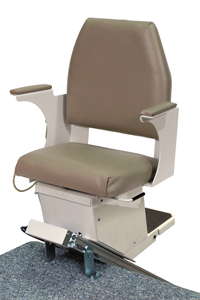 Stair lifts range from anywhere between $1,500 and $8,000, depending on the model, track, and distance traveled. Most stair lifts use a straight track that carries a chair up and down the stairs. If you get a base model with a straight track you will be paying at the lower end of the price range. Even with a basic stair lift you will still get a chair with arm rests, a foot rest, seat belt, and rechargeable battery. The rechargeable battery will charge whenever the lift is not being used, allowing for you to use the lift even in a power outage. The great thing about stair lifts is they have a low cost of ownership. They plug into a wall outlet, so they use very little energy, and rarely require any maintenance. If the staircase in your home takes a turn before getting to the next floor, you will need to purchase a stair lift with a curved track. This will require a custom curved track that is designed to fit the dimensions of your staircase and will be more expensive. Even though a custom curved track stair lift will be at the higher end of the price range, it is a priceless investment. It is hard to put a price on the independence and mobility that a stair lift will give you. It is important to figure out your budget and needs before you choose a stair lift. This will help you decide which stair lift will work best for you. While you may have to pay a little more for a curved track, it will still be cheaper than hiring an aid or moving into an assisted living facility. Being able to stay in your home and live independently will prove that a stair lift in your home is a wise investment.